Anyway, I have recently made twenty-some variations on Chris Palmer's Flower Tower. This is one of them, and you can see the rest on my photostream if you like (http://www.flickr.com/photos/ahudson/). I started doing these right after I found out about the decreeping technique from a description of the process that Tom Hull had written (www.spundreams.net/~andy/origami/flower-tower-howto.txt). Working from there, I modified the model by pursing the center in different ways, and then generalized the structure to a non-logarithmic form, which you see here in this picture. 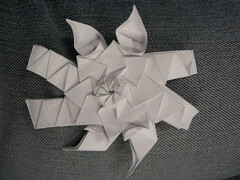 I also used some elias stretches and shaping folds to finish it off. Anyway, I'm starting work on a big post about logarithmic tessellations (like this one), and I should post it in the next month or so. This is a Flickr badge showing public photos from origami_madness. Make your own badge here.